After we seemed to have talked out just about every option for out work, we exhaustedly began discussion other subjects, like our previous work. I showed Aram my single previous interactive work (an installation involving a tracked goldfish whose real-world movements were used to animate a ‘virtual’, illustrated fish projected next to him). Personally though, it was seeing Aram’s previous work (mainly his ‘conceptual sculptures’)(for lack of a better term right now) that really produced the next idea – Aram had a way of juxtaposing two seemingly simple ideas to create something new, and often startling. We’d returned to the subway imagery, after trying to find creative correlations between every part of the acupuncture process and every part of the subway experience, and it dawned on us: why not simply replace the subway lines with the acpuncture ‘meridian’ lines? What if they were made equivalent? What points on the city would be revealed by the unexpected intersections of body and geography? This unexpected thought really seemed to connect (in a clear, direct way) a lot of the ideas that had been floating around in the last week. This twinning of body and city, the recognizable and the unfamiliar, felt really right, and, to excuse and inexcusable pun, on point. After our first prototype was pretty well-received by teachers and classmates, we were still struggling to push the idea further. We starting working further on the physical fabrication (thinking of illuminating the acupuncture ‘spots’ with fibre optics) and the Processing visuals (working with loading in and switching between recorded videos). We began to feel that we weren’t moving forward in an appropriately steady manner. Aram felt it might be beneficial to get some ‘expert’ advice, and he set up a meeting with his friend and former ITP student Joo Youn Paek. This which was really, really helpful. Joo Youn really made us aware that we hadn’t answered a fundamental question: who was our target user, and what did we want them to experience? Joo Youn emphasised the need for our project to communicate clearly – we soon realized that we’d been proceeding on different, competing paths with our visuals and our physical model (if our physical form was going to light up, how might this be useful to the user, besides being potentially pretty? What kind of information were we conveying, and how would we coordinate this?). She made use consider the user-incentive to interact with piece, and asked if the existing mystification of acupuncture was something we wanted to combat or something we might knowingly incorporate. She really provided clarity on our own need for directness in at least some portion of our project if we hoped that people would connect with it. While Joo Youn seemed excited by the educational potential of our project, we still weren’t certain that we wanted to make it a teaching tool, and it brought up the biggest issue we hadn’t really answered. The overriding conflict in this project was the choice between an educational, instructive model – a chance to impart knowledge and illuminate and oft-misunderstood process – and one that had a greater capacity for personal and creative involvement, where we might bring our own feelings and intepretations to bear. While we wanted to involve our knowledge of acupuncture and it’s process (mine recent and relatively shallow, Aram’s older and deeper), we didn’t want to end up with a museum exhibit piece. And we weren’t looking to promote acupuncture – we both agreed that we were more interested in using acupuncture as a ‘base’ for the project, and allow a certain freedom of interpretation in the work, so that it’s reach would be extended – people need not fully understand or agree with the process of acupuncture to be interested or intrigued by its underlying concepts as presented in our work – we wanted to give ‘clues’ about acupuncture (accurate clues, in a sense) that would allow a greater, metaphorical relationship to grow with the work. That’d be the ideal. How we were going to achieve that, we still didn’t know. n the process of discussion, we returned again to the idea of human organs as having emotional connotations, in both traditional Chinese medicine’s school of thought, and in a variety of other contexts. I brought up the Greco-Roman notion of ‘Four Humours’ – simply put, the idea that human emotions and conditions were caused by certain bodily fluids, which needed to be kept in balance. We get the phrase “venting one’s spleen” from this, as well as the adjectives “melancholic, “sanguine”, “choleric” and “phlegmatic”. We (I think it was Aram , really) hit upon the idea of personal representations of the body’s organs and their related behaviours. 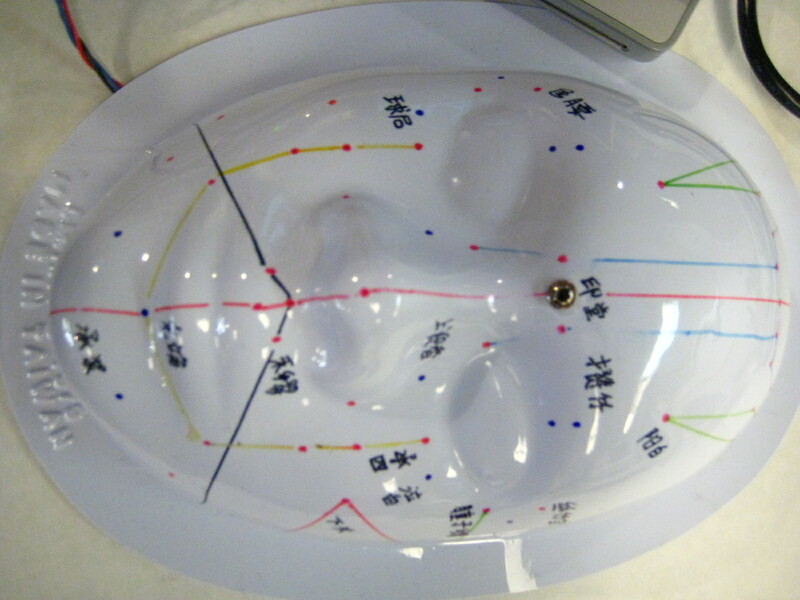 Performing acupuncture on a model could alter the condition of a represented individual on a screen. I thought that perhaps the array of organ-people could be arranged according to their corresponding placement in the actual bodily (this could be achieved by arranging video windows on a screen, or, Nam June Paik-style, by stacking monitors on top of each other). After being excited by this idea, we went and made our first prototype: it’s a store-bought mask of a face, on which Aram drew the appropriate points and characters. We then connected a simple digital plug switch at a crucial intersection (a point in the middle of the forehead), and this fed into a Processing window, which showed a ‘Sad Aram’ switching to ‘Happy Aram’ when our ‘needle’ was applied. Besides choosing which of these potentially complex and multilayered ideas we would foreground, there were multiple tensions that arose when deciding what methods of representation and user-engagement we might use. We debated a horizontal vs. a vertical screen interface, a 2D or 3D model, a sculptural or an illustrative approach. We talked about whether we were creating a game or an artwork (of course, ITP is all about blurring those lines, but we thought framing it as a binary thing might help us hash out our real direction). While still thinking of the subway model, we wondered if the user might insert a stylus needle into the appropriate point to relieve traffic congestion on the screen interface – the goal of the game would be to relieve ‘congestion’ by restoring an even flow of pedestrian traffic to the subway. The connection between the energy flow in the body, and the transport of blood through the veins, seemed very connected to the transport of people around a city. Ultimately we felt that a game interface might restrict the mode of engagement with the work – we wanted something that would interest people, but not simply test their reflexes or patience. Presenting our concepts in the way we wanted seemed to require something other than a game, at least not the kind of game I’d initially envisioned. * Balance and Counterbalance – the idea that a healthy body is a balanced one, with the forces of yin and yang acting in harmony. * The Emotional Body – the notion that every organ has a specific emotional connection and effect (to put it too simply – a troubled liver might explain a bad temperament, for instance). “Aram brought his acupuncture doll to the floor on Thursday, which opened up some new ideas – one of the things that Aram had expressed earlier was the visual connection between the multiple ‘nodes’ on the doll (connected by colour-coded lines) and the NYC subway map. This seemed an apt metaphor for the acupuncture process – the subway lines as veins or energy ‘meridians’, the flow of people through the city like a bloodstream. Acupuncture, as Aram explained, is about balance – in a simplified way, it’s about locating ‘congested’ areas on the body, places where there is an uneven distribution of resources. In this way, it’s a lot like a microcosm of a public transport system. 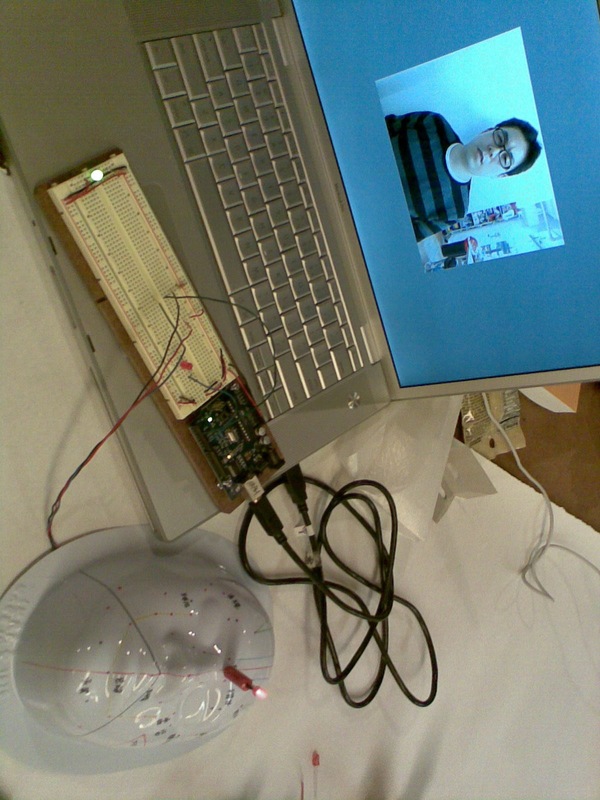 This is the blog that is going to document the as-of-yet-untitled, acupuncture-oriented final project of Mitch Said and Aram Chang, for their first semester at NYU’s Interactive Telecommunications Program. Here is the equivalent on Aram’s blog.